ICAl conducts this examination called Common Proficiency Test (CPT) twice every year which is the entry requirement for the coveted Chartered Accountancy Course. It is customary for many such examination results to be analysed either by the examination conducting authority itself or by interested representatives of the public. ICAI limits its analysis to providing the pass percentage split between genders and regions. No deeper analysis is available. Therefore, the analysis provided is of no practical use to the future aspirants. An attempt has been made here to do an analysis of the last examination results which can help future aspirants to understand what is happening. Statistical methods have been used to analyse the results. The method employed guarantees a result within 4% margin of error in estimations. No claim is made to the absolute accuracy of results. ICAI is not involved in this analysis and no permissions are required or sought from the Institute as the data can be accessed by public by through their website: caresults.nic.in. The results database is not in public domain, therefore round about methods have to be used to obtain the data sample. By trial and error it was established that 1,05,978 students had registered for CPT Dec’11. One thousand random registration numbers were then generated within that range. These were fed into the above site one after the other and the result recorded. The results were then analyzed to obtain the information described later. Median means the central number. The number of candidates who have obtained marks above or below the Median are the same. The Median for the results is 86. 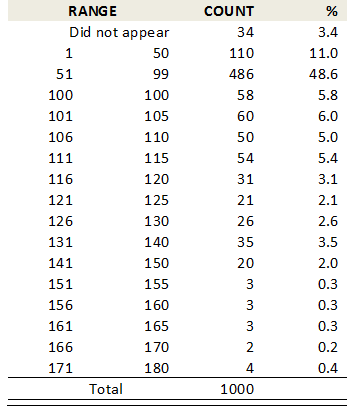 The Average (or Mean) marks obtained is 87 (see table 1). This is also similar to those obtained in the past few years. The overall standard of examination viz. –a- viz. the examinees seem to be maintained. The Standard Deviation is 33. This is the measure of how much the data is scattered around the Mean. 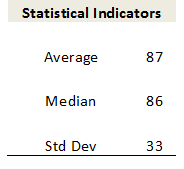 Typically, 68% of results are within the Mean + or – one Standard Deviation. 37% candidates have qualified by scoring 100 marks or above. 3.4% students registered but did not appear in the examination. This is not a new phenomenon. Every year we see students approximately around this percentage dropping out. 11% examinees have scored 50 marks or less. These students are just taking a shot at the examination without adequate preparation. They need to learn that examinations and many more matters in life are not cracked by luck alone. They need to work towards a goal. We hope that they are now working sincerely for June’12 Examination. Percentile is an important indicator of the standing of the examinee compared to all others in the competition. A percentile score of 94 means that 94% of examinees have performed worse than the candidate. 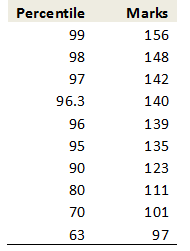 Look at the scores required to achieve the percentiles. 100 marks should give a percentile of 67. But 67 percentile happens at 97. This is a curious anomaly that is discussed later in Surprise Bonus section. An important percentile to note is the 96.3. This happens at 140 marks. These marks mean that one is in the top 3.7% examinees – a number which eventually clears the CA finals going by the current trends. We referred to special discovery in the percentile calculation. Using a cricketing term, let us now look at the number of candidates who have scored in the nervous nineties. 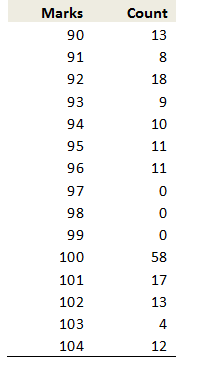 Now look at the number of candidates who have obtained 90 through 99 marks in table 4. While the number for 90, 91, 92, 93, 94, 95 or 96 are in the range of 8 to 18 each, suddenly at 97, 98 and 99 there are no examinees. If we go beyond 100 at 101, 102, 103 and 104 again we have 4 to 17 examinees each. At 100 there are 58 cases. The simple conclusion one can make out of this data is that the Institute has given a grace of 1 to 3 marks and passed all students at 97 or above marks! This is a Bonus. An extensive analysis of the examination results of the past few years show that only one third or less students pass every stage of Chartered Accountancy examinations. Roughly 100 candidates in CPT become 33 for IPCC. After IPCC this number becomes 11. And at Finals the pass out is less than 4. Please check your capability. Finally, it is the best (overall terms and not only CPT scores) who will make it in the end.